I love it when a plan comes together. 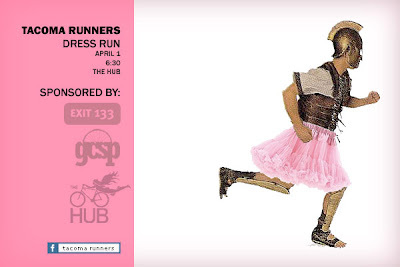 This week, the Tacoma Runners' Thursday Beer Run will prance around T-town in dresses, spreading the kind of good cheer that can only be conveyed with activity-inappropriate clothing. The debacle is being sponsored by the Tacoma blog, Exit133, our own Grit City Self Propelled, and the Harmon Hub. The Hub, in addition to providing a venue for 20 or so sweaty runners in questionable evening wear, has offered awards for our prize packs, plus a FREE large pizza for every seven people that show up. Wow. That our little group continues to grow and generate excitement in the community never ceases to amaze me. 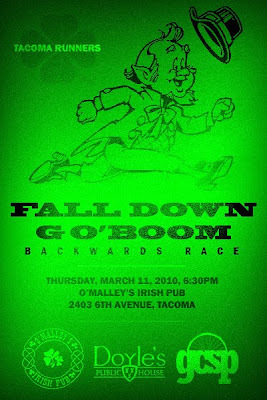 And the way Tacoma residents and businesses rally around fun activities like the ones we're putting on is inspiring and energizing. Thanks to Matt at Tacoma Bike Ranch for introducing us to the folks at Harmon. And thanks to Derek at Exit133 for being the biggest t-town advocate this side of Wild Waves. I'll post up some photos and an account of this disaster in a few days. Same streets, same trees, same dirt, grass, concrete, and railroad tracks. Same time of day, same routine to get ready, and the same, skip. Same, skip. Same music on your mp3 player. When "regular" runs get to be a chore, it might be time to slow down. Slower. Slower. Stop. Bend down and touch the asphalt your feet pound every day. Lean over the railing of that bridge you always run across and see what's down there. Yesterday I took our crappy little point-and-shoot along on my "regular" lunchtime run. I wanted to see these seven miles in a different way. Or perhaps more accurately, to be reminded of the intricacies I've come to ignore. Some of the photos were taken on the move, others while stopped. Stitched together, they tell the story of a run in the dirty, beautiful, broke-down town I love. Just another run. Hardly a day goes by that either Lisa or I don't proclaim our love for this town. Tacoma has given us room to stretch our legs, courage to try new things, and fresh perspectives on the meaning of community. It's given our kids more stability and a better shot at success — even if they don't realize it yet. Lisa and I solved Groucho's conundrum by starting our own club. In the Tacoma Runners, we've found kindred spirits and a weekly date night. It started with a simple post to Twitter... "Trying to gauge interest in a Tacoma running group. Laid back, beer-centric." The first jog went down a few days later, with six like-minded beer runners. Last week we drew over 30, and organized a one-lap backwards race as part of the run. 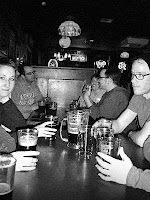 We even found some sponsors to fill prize bags with t-shirts, gift certificates, and booze (thanks Doyle's, O'Malley's, and Grit City Self Propelled). This is all-new territory for us, and we had a great time doing it. Next chapter indeed! Recognize that name from the sponsor list above? I've hesitated to mention GCSP here, lest it fall victim to "the curse". See, we've tried to get a similar venture off the ground in the past. Twice. Both times, after a mention on this blog, the websites vanished mysteriously. So what's gonna make this one different? Place. GCSP is starting from an honest, simple place. It's starting at home. 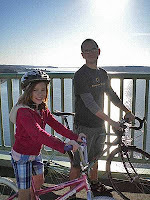 We'll be a resource for Tacoma's cyclists, runners, walkers... everyone living (or aspiring to) an active life here. And we hope to become an advocate for those groups in the shaping of public policy and infrastructure as the city continues to grow up. Again, all new territory for us. So there you have a peek into two of our new, ongoing adventures. Our energy seems to be building... no doubt thanks to the wonderful people we're meeting, and the encouragement that comes from seeing our kids thrive in new ways. Thanks for having us, Tacoma. We hope to bring you very, very much of the awesome.